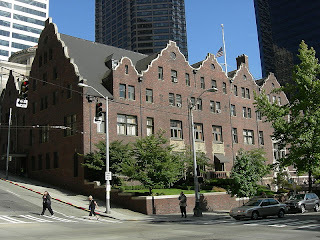 There has been a big stink of late in Seattle about a proposal by our congressional representative, Jim McDermott, to obtain $250,000 for a tony social club in the city. Seems that The Rainier Club is having issues with some of its windows and wants to rehab them. Unfortunately, the club’s members have been willing to pony up only half the cash for repair work. This is where McDermott has stepped in. He included money for the club as part of a number of requests he made to the House Appropriations Committee. Since the local paper reported the story, readers have expressed much indignation. How could such a club, long a haven restricted to men only, get money in such dire times? I don’t want to comment exclusively on the request, but would like to point out something that no one has noted – the repair work would be for window sills made of Salem Limestone. The builders of the Club’s home used the 330-million- year old Indiana rock as a contrast to the main building material, brick, both inside and outside. Of particular note is the low exterior wall next to the sidewalk, a place I often stop on my building stone tours because of its excellent display of fossils. These include bryozoans, crinoids, and brachiopods. Ironically, quarry workers in Indiana consider this fossiliferous stone to be of inferior quality, mostly because it is less homogeneous than other layers of the Salem. I think that providing money for the Rainier Club is rather absurd but I am loath to completely criticize McDermott. I can certainly think of worse ways to spend our federal money than on Salem Limestone. I link to your blog from mine. Here's my post today, which has to do with Blogger, not with geology. Good post. We've linked to you at http://unclebrice.com/?p=293.